OUTPOST: This platform, built off the coast of Phuket by an American man and his Thai wife, is considered to be illegal. 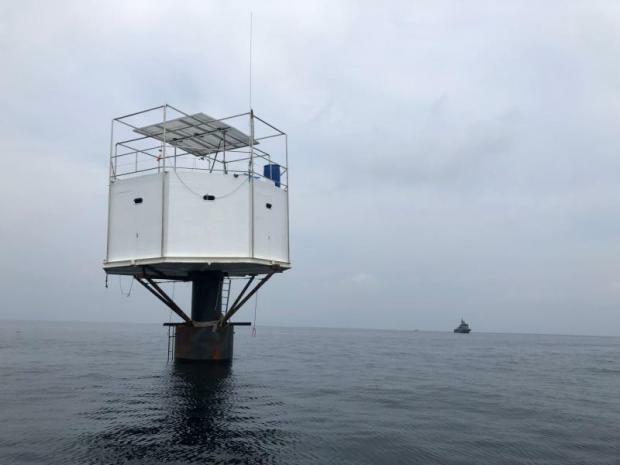 The Third Naval Area Command has filed a police complaint against an American man and his Thai wife who set up a floating living platform 12 nautical miles off the coast of Phuket, a practice also known as seasteading. Staff judge advocates from the command were sent to lodge the complaint at Wichit police station in Phuket on Saturday, according to a source at the command. "The regional office of the Marine Department will be contacted to remove the structure from the sea soon," the source said. "If it is left untouched, it will hinder ship navigation since the route is used for the transport of oil to Phuket." The Maritime Enforcement Coordination Centre's third area command on Saturday held a news conference about the seastead, covered recently by both domestic and foreign media. Vice-Admiral Sittiporn Maskasem, commander of the Royal Thai Navy Third Area Command, on Saturday sent officers to where the structure was set up, 15 nautical miles southeast of Racha Yai island.